Pre-1933 United States gold coins are popular among numismatists and bullion investors alike. These scarce collectible coins offer incredible designs from some of the nation's most notable coin designers and consist of metallic compositions containing a 90 percent gold alloy. With this combination of beautiful designs and substantial bullion content, it's little wonder that pre-33 gold coins enjoy a huge following by both coin collectors and metals investors. The most common pre-33 gold bullion coins include the $2.50 quarter eagles, $5 half eagles, $10 eagles, and $20 double eagles struck between the 1840s through the 1920s. Coins made before that period are generally considered "early" gold coins and are worth far more than their gold spot values, while the few gold coins made after that period but before 1933 are highly scarce. The $1 gold coin struck from 1849 through 1889 is also popular with gold coin collectors, but the numismatic premiums on these low-denomination pieces are significantly above their spot value. The $3 Indian Princess gold coins are scarce but financially obtainable by many collectors, while $4 Stellas are rare coins with six-figure prices. Of all pre-1933 gold coins, perhaps the most widely collected is the $20 Saint-Gaudens double eagle. Designed by famous sculptor Augustus Saint-Gaudens and first released in 1907, the Saint-Gaudens gold double eagle coin is widely considered one of the most beautiful coins in the world. While there are plenty available to currently meet numismatic demand, Saint-Gaudens double eagles $20 gold coins are much scarcer than their original mintage figures may suggest. Their entry-level price of about $1,350 (with gold at $1,300 per ounce) puts these gorgeous pre-33 gold coins out of reach of all but the most financially well-heeled coin collectors and investors. Due to the relative financial expense associated with collecting gold coins, they are usually not assembled in sets by date and mintmark as are many modern United States coins. 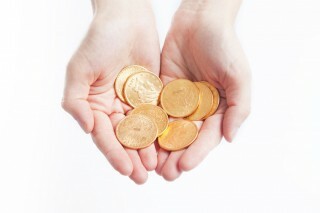 Most coin collectors consider themselves lucky to own even just one or two pre-33 U.S. gold coins. Those who can afford to buy multiple gold coins might try their hand at assembling a basic type set. U.S. gold type sets may entail collecting one example of each of the four primary gold denominations, including the $2.50 quarter eagle, $5 half eagle, $10 eagle, and $20 double eagle. Another popular type set option includes buying each of those four gold coins bearing the common Liberty Head design (1840-1907) by Christian Gobrecht, or the four 20th-century gold coin designs struck between 1907 and 1933; those include the unique, incuse Indian Head motif $2.50 and $5 gold coins by Bela Lyon Pratt and Saint-Gaudens' two designs, including the Indian Head $10 eagle and famous Liberty $20 double eagle. Either four-coin type set costs at least $3,000 to complete when gold costs $1,300 per ounce, and such coin sets are gorgeous collections that may become great investments for those who speculate in gold bullion.